Seventeen spirituals sung by the girls of Amazing Grace Children's Home in Awasi, Kenya, a home for girls who have been orphaned by AIDS. The songs are all in the traditional African a capella style. 100% PROCEEDS GO TO THE GIRLS!! In July, 2009, the rector and 10 members of All Saints' Episcopal Church in Fort Worth, Texas, took a mission to the Amazing Grace Children's Home in Awasi, Kenya. While called a "children's home," Amazing Grace has from its inception five years ago been a girls' orphanage. 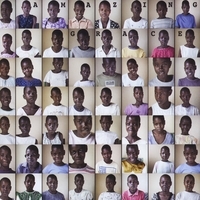 Amazing Grace is home to 72 girls ages 7 to 15 whose parents have died of AIDS, which ravages the continent of Africa. The home was established by Father Ogacho Abuto (formerly a priest at All Saints') and his wife Clarice. While other missions have gone in the past to either build or oversee building infrastructure, this mission was different. The point of this mission was to get to know the girls of Amazing Grace. For a week we took them to the museum at Kisumu in shifts, took them to buy shoes, and conducted a week-long modified Vacation Bible School. We sang American songs with them. Then they sang some of their songs for us. Those songs, which are simple and breathtakingly beautiful, are what is on this CD. Our days at Amazing Grace centered around a building with concrete floors, cinderblock walls and a tin roof that served as a meeting room, dining room and classroom. That is where each of the songs on the CD was recorded using a small, handheld stereo digital recorder. While the girls sing, you can hear a dog bark, you can hear chickens. You may hear a truck on the highway. Sometimes you hear adults talking. This is not, after all, a studio recording. But incredibly, none of this detracts from the music. For a week we found ourselves on a small, two acre plot of land in one of the poorest countries on the face of the planet and discovered something of almost indescribable beauty. And what was so generously shared with us, we would like to share with you. Every penny from the sale of this album goes to support the girls of Amazing Grace. To find out how else you can help, please go to http://www.allsaintsfortworth.org.